Elton John returned to the Erwin Center Saturday night for the first time since the late 90's. We returned to the Erwin enter almost a year to the day from our last visit - but not quite as close this time as a year ago when Jo had her elbows on the stage for Bruce last April! We didn't even decide to go until Tuesday last week and only because I got an email that they were releasing some additional tickets for $47. What a deal and they were great seats. Although we were behind the stage we had a direct line to Elton's piano when we sat down in the 6th row of the upper bowl and with the row in front of us having one seat and our row having only three seats we had our own little section all to ourselves! An email had come in Friday advising that the doors would open at 7 PM and the show would start promptly at 8 PM. I guess not everybody read that since at 8 PM the place was really empty. But miraculously it filled up in the next 15 minutes and the show started at 8:15 PM - no warmup band just Elton and his band. Amazingly this band includes two of the original members with Davey Johnstone on guitar and Nigel Olson on drums. I just read this morning that this was the highest gross selling show ever at the Erwin Center with sales of $1.3M surpassing Pavarotti so I guess the crowd was all there! The show started with an extended instrumental opening to “Funeral for a Friend/ Love Lies Bleeding” as I'm guessing that was done on purpose to give everyone a chance to get in their seats. We had seen Elton long ago in Chicago at the United Center and although this show was many of the same songs, he is always the showman and a great entertainer. The highlight of the show to me was a great version of "Madman Across the Water" which isn't even one of my favorite songs but it was a terrific rendition of it. Near the end of the show I asked Jo, "What have we missed?" and she had a hard time of thinking of a song she wanted to hear that he hadn't played, my only request was "Crocodile Rock". I guess that made sense since it was the next and last song he played in the main set. Another outstanding performance of that song as well and definitely a great way to end the main set. After a short break Elton came back out and here was a great twist. He walked all along the front of the stage signing all kinds of autographs. A real treat for the fans and they must have known he was going to do that as they came prepared. I would have never thought to do that. My only disappointment was the encore. I'm a big proponent of making the encores special and that usually includes songs that rock. I want to go home with high energy in my head and I am used to that with Bruce shows. Elton played a great version of "Your Song" to start the encore but then just played "Circle of Life" from the Lion King and that was it. Again, it's a beautiful song but doesn't have me leaving the arena buzzing. Overall at over 2 1/2 hours of show time that is a great performance. Maybe Bono and the boys need to take notes on that. Another interesting story was that before he sang "Philadelphia Freedom", which is a song I am not a big fan of and don't know how it fits in a show in Texas, he was thanking people. He pointed out one guy in the front row who we had been watching. This guy was into every single song, a little too much from my point of view but at least he was into it. 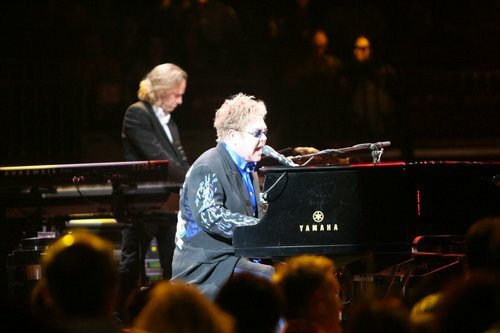 The guy told Elton this was his 167th show. Seriously - 167 shows???? Do you really want to see anybody 167 times? Do you have a life? I am harassed by some for seeing Bruce 11 times - 167. Man that is a lot of Bennie and the Jets that's for sure. Overall, a really strong show, a great price and a great Saturday night in Austin. I'm jealous. 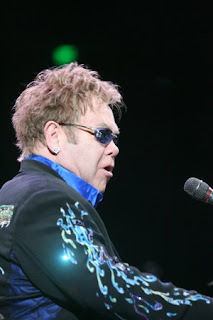 Elton is on my list to see someday. You know, if I ever get to leave the house again. Sounds like a great show although, I'm with you-the encore sounds pretty lame. Can't wait to hear all about Slaid. I just played him this morning while I was cleaning out a closet.